In the animal kingdom many animals store food to see them through the difficult winter period, but in the case of the grey squirrel it has been shown that 74% of their buried stores fail to be recovered. In the age of accelerated industrial obsolescence, some manufacturers have taken a similar approach, stockpiling spare parts for their industrial automation systems in case of equipment failure later on. Using a more modern approach can streamline this process by maximising factory space and minimising waste. When SIEMENS and the German Government created the concept of Industry 4.0, they played heavily on the idea of the smart factory, in which the whole facility is integrated, connected, intelligent analytics orientated and focussed on reducing downtime and waste. The idea of lean manufacturing itself, a method for lessening production waste, has been around for much longer - it was developed by Toyota executive, Taiichi Ohno and first implemented shortly after World War 1. Worryingly, a recent report by the Institution of Mechanical Engineers found that 92 per cent of UK manufacturers do not have significant understanding of Industry 4.0 processes, even though 59 per cent recognise the impact it will have on the sector. This leaves UK manufacturers at risk of falling out of step with international manufacturing businesses, who are embracing the factory of the future and the intelligent connected systems presented by Industry 4.0 as essential for competition on an international level. So, how can manufacturers fully embrace the smart factory concept? One of the key steps in the process involves incorporating sensors into equipment to connect them to the internet of things (IoT). However, communication alone is not enough for a plant to define itself as a fully intelligent factory if the communication is limited to the factory floor. Decision making at all stages of the manufacturing and distribution process – including the supply chain - can be made using complex analytics that don't require human intervention. Two simple ways in which using a smart supply chain maximises the benefits of the smart factory are cost and space savings. The smart supply chain system is both self organising and self optimising. 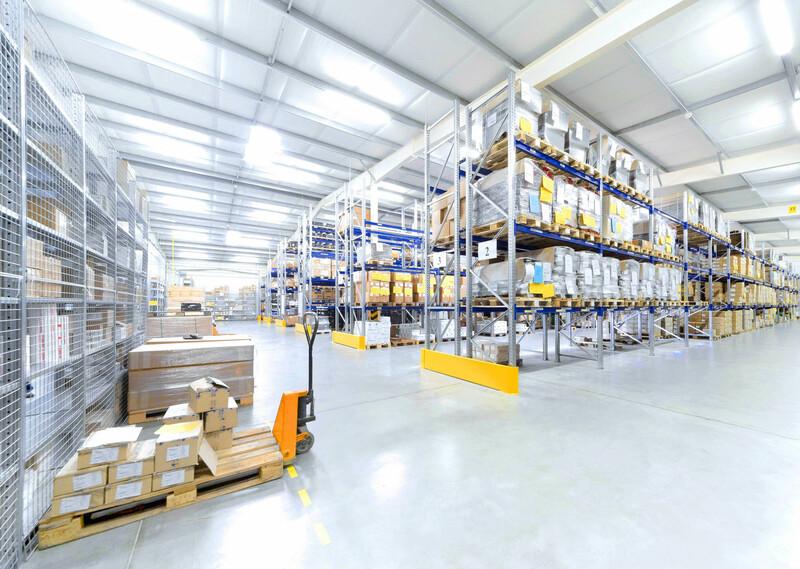 Data from connected sensors in the factory can be integrated with data on user preferences, data on weather and any information on any other variables that enter the system. A smart system can predict a bottleneck arising from an abnormal weather event and pre-empting this can be used to streamline the system and prevent waste from excess production, leading to leaner manufacturing. One example of the incorporation of the smart supply chain into a business model is the retail giant GAP, which uses the seamless inventory model supported by technology from GT Nexus Tech. This focuses on having the correct products available in the correct quantity at a given time. GAP is able to monitor inventory and track goods down to each individual item, improving user experience and reducing the cost of the process in its very competitive environment. Manufacturers often stockpile replacement parts, particularly those parts with the highest risk of failure. This large amount of extra stockpiled equipment is left to sit gathering dust, all the while taking up valuable factory space. This is particularly relevant for companies running legacy systems as the acceleration of industrial obsolescence may cause plant managers to believe that replacement parts for faulty equipment will be difficult to find. Predictive analytics can be used to monitor the condition of all operating equipment in a factory, so if equipment is performing sub-optimally an alert is sent to a plant manager automatically. This means that in many cases a replacement part can be installed before the entire process breaks down. Incorporating the smart supply chain into this process is a simple way to improve it even further. If equipment can detect and monitor an issue with the system and adjust accordingly, this could prolong overall lifespan. If adjusting the system is not an option, the smart factory could order a replacement part from a reputable supplier of obsolete industrial parts, such as EU Automation, without any human involvement at all. This would eradicate the need for manufacturers to stock spare parts in their own plants, reducing waste and increasing available factory space. Operating the smart supply chain in this way means you don’t have to worry about seasonal availability – your spare parts will be available all year round. We all know winter is coming, but smart manufacturers using the most advanced strategies, techniques and smart technology will make it through to spring, without as much waste as the grey squirrel, with its unrecovered stores. Bob Davies is international operations manager with EU Automation.